With the various options available on the market, choosing the perfect pair of climbing shoes can be a challenging task, especially if you don’t really know what you are looking for. The task becomes even more confusing once you get to see the actual shoes themselves on display. There are climbing shoes that are so stunningly designed that it’s hard to resist the impulse to buy them based on looks alone. I am guilty of this, and I am pretty sure a lot of you are too. It is a good news though that you are checking out this La Sportiva Men's Miura Climbing Shoe Review. It probably means that you know there is more to buying climbing shoes than mere aesthetic appeal. Yes, the looks matter to a certain degree but it’s the shoe’s performance on the field that should carry more weight. Of course, you can’t exactly take out the brand new footwear from the racks and take them out for a spin. That is where this review comes in. Hopefully, you’ll find everything you wished to know about the La Sportiva Men’s Muira Climbing Shoe. Who knows if this is what you are looking for, right? 5 The Bottom Line: Is this the Right Climbing Shoes for You? You are looking for a shoe that is durable and easy to use. You prefer going on climbs with increased control and comfort. You are contented in going on a run or on a climb with just one shoe for the next years. You are looking for strong and supportive shoes in general. You want to take your shoes off between climbs and make fast adjustments to the fit. You prefer to tackle advance bouldering as it is not aggressive enough for that purpose. You wish to change shoes with every latest trend. Expect you and your La Sportiva Men’s Muira to be together for a long time. This is one of the most durable climbing shoes you’ll ever find, thanks to the special materials used for its midsole and outsole. The shoe sports a 1.1mm LaspoFlex midsole which is known for being tough and durable. Designed for torsion rigidity, the lightweight midsole can take a beating and will retain its shape even after years of use. Similarly, the 4mm Vibram XS Edge outsole is extremely durable and has the capability to retain its shape even after several rounds of climbing. Leather is one of the best materials to use for the upper parts of climbing shoes. It is breathable, allowing some air circulation to your feet - adding to its comfort. In addition, it offers you that next-to-skin comfort, and with its stretchability, it will eventually conform to the shape of your feet for a better fit. With its Dentex lining, you will be able to keep your feet dry with its moisture-wicking properties. The material also gives you a degree of comfort not found in other high-performance climbing shoes ensuring that you will not wear out soon. Velcro straps have long been recognized for their superiority over lace when it comes to the convenience when putting on or taking off a pair of climbing shoes. With the La Sportiva Miura fast lacing system however, Velcro straps’ advantage becomes blurred. La Sportiva Miura quick-pull lacing system allows you to quickly adjust the fit of the shoes for maximal comfort and fit. In addition, you will always have that added assurance that the shoes won’t just come off by themselves because they are secured by laces. They are especially ideal for longer routes since you can quickly re-adjust them when necessary. Perfect for Edging - The La Sportiva Men’s Miura Climbing Shoe is perfect for edging. In fact, we’ve discovered that it is probably one of its strongest points. Thanks to its asymmetrical toe box along with its LaspoFlex midsole and Vibram XS Edge outsole combination, you will be able to get a secure foothold even in the smallest of nubs. You’ll be able to support your entire weight with the tips of your toes thanks to the footwear’s design. Crack Climbing - We’ve also found out upon testing on a few routes that the shoes perform rather well in crack climbing. However, be sure to get your shoe’s size right so you can use it to your advantage. Good choice for technical routes and bouldering - This footwear offers a great combination of sensitivity and precision. Thus, it is fully capable of handling technical routes as well as moderate levels of bouldering. Surprisingly comfortable given its aggressive build - Aggressive climbing shoes are not exactly known for the comfort level they provide - they are built for performance after all. Fortunately, the La Sportiva Men’s Miura does not seem to come from the same mold. They are reasonably comfortable especially when one considers that they are an aggressive pair of shoes. Well-rounded pair of climbing shoes - Muira scores pretty well in a lot of areas used in evaluating a good pair of climbing shoes. Thus, we can say that this footwear is a good all-rounder. It might not be the best in one particular area but you’ll certainly want to wear it in cases where the terrain forces you to face a diverse set of challenges. That means that you can use the La Sportiva Miura for rock / hard climbing with its accuracy. In addition, you can also use them in trad routes with equal ease. Easily adjustable laces - Some climbers are biased against lace-up shoes as they deem them to be inconvenient. Fortunately, the La Sportiva Men’s Muira breaks the mold. Users will soon find that adjusting the laces along the route is a very easy task, thanks to the shoe’s fast lacing system. There is a manual available online - The manufacturer has an online manual available so you can check it right away. It gives you an easy access on the information you need any time of the day. The shoe’s upper part is made from 100 % leather - If you love leather shoes, then this is the perfect climbing gear for you. Made from pure leather, it is not only elegant but it also gives you that breathability and stretchability that only leather could pull off. It might take time getting used to - This is a no-brainer as even normal shoes will take some time before you become used to them. But in the case of climbing uses, it might not be the best time to familiarize yourself with the footwear while on an actual climb. Make sure to give it a spin in your local climbing wall before heading out into the real route. Or you can use simple techniques to break in your shoes first. Might not be the best option for very advanced bouldering - Yes, we remember saying that the Miura is a pretty good all-around pair of climbing shoes. However, there are limitations. As far as we are concerned, it may not be the best choice for advanced bouldering as it is just not aggressive enough to be used in that scenario. A bit on the expensive side - Price is a very important factor for every buyer. Unfortunately, these shoes are a bit expensive compared to other brands. Might take longer to break-in - As a high-performance climbing gear, this is not the softest or most sensitive pair of climbing shoes you’ll find. As such, be prepared to take a longer break-in period. “I had a pair of these years ago when I was climbing more regularly and used them for years. They have great edging power, and the fit is very tight in all the right places without being such a squeeze that I can't keep them on for longer multi-pitch work. Some people have had problems with quick delaminating--I haven't experienced anything of the sort but will keep an eye out for it on this pair...” - wrote a verified Amazon buyer. The Bottom Line: Is this the Right Climbing Shoes for You? Now, after going through all the features, pros and cons that we’ve discussed, you are now faced with a very important question - do you consider this shoe the right pair for you? If none of the features, as well as the cons we’ve mentioned, have deterred you thus far, then we highly recommended this product. This pair of shoes is one of the best all-around climbing shoes we have reviewed. While it may not be the best of its class in one particular area, that minor disadvantage is totally offset by the fact that it scored pretty well in all areas. It is the pair of shoes that you will find useful no matter what surprises the terrain may hold. Of course, the final decision must be yours. After all, it is your preferences that will truly matter in the end. 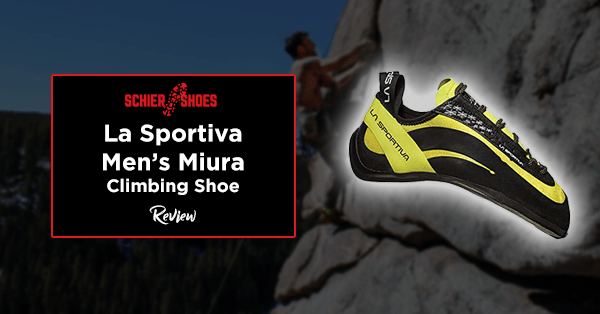 However, we certainly hope that this La Sportiva Men’s Muira Climbing Shoe Review was of some help to you.